Long time no read. I could say that I’m sorry and that my bad conscience is killing me for not posting for so long. But in fact this little time out was pretty much needed. I spent 2 wonderful weeks in Scotland and I hope I’ll be able to finally edit all the photos I took soon as I have a lot to tell. My plan to get right back into blogging however went a little wrong as I visited some friends and family afterwards, had to work and also had a little food styling job for a client to do. But all in all I really miss blogging, writing, taking food photos just for my own enjoyment and interacting with other crazy foodies such as me. So here I am. Back with a quick and easy recipe for a start. 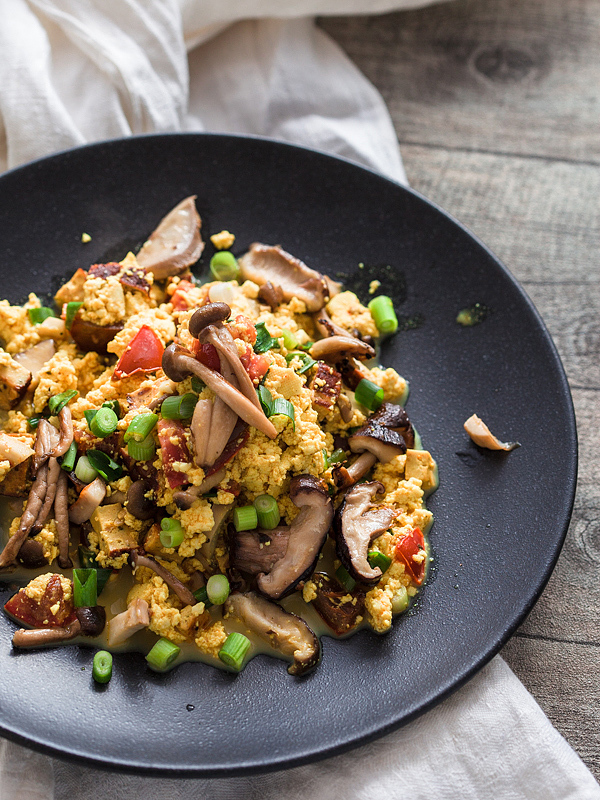 Some time ago (in June *cough*) I created a new variation of my Scrambled Tofu Recipe. Check it out if you haven’t already. For the new recipe I actually combined 3 different types of tofu in order to get the texture even closer to the original. However, if you’ve never tried it before you might as well try the older recipe first to see how you like it, before buying 3 packs of Tofu. The most essential ingredient apart from tofu is Kala Namak, a black salt that will give your tofu the characteristic egg like taste. You can probably find Kala Namak in organic supermarkets, vegan stores or health shops and if everything fails the internet is your friend. Unfreeze the mushrooms in water and slice into thin stripes. Fry in a separate pan and salt lightly. Put the fresh tofu in a bowl and mash it softly with a fork. If it's too soaky drain off the excess water with your hands. Add the silken tofu and the spices to the bowl and mix it together, then add it to the pan with the smoked tofu. When it's all heated up properly and mixed together add the tomato and green onions lastly and let it simmer for a couple of minutes. It shall serve you as a source of inspiration and motivation to love your leftovers and create amazing dishes with them.